"Control your emotions in this realistic 3D online poker game"
If you are fan of poker, but you don't always have time to meet with your friends or go to a casino, then try this game. 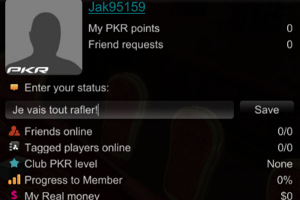 PKR is one of the most popular online poker clients with millions of not only registered accounts, but real and active players. It is a fascinating game that allows a high level of customization and that will really help you improve your poker skills. Create you avatar, know your opponents, work on your strategy, and win all the chips. PKR features impressive 3D graphics that will make you feel as if you were playing The Sims. Apart from all the poker elements also present in other poker games, what makes PKR special is that your character actually shows emotions. You can control your body language, tell some jokes, start a conversation, and more. So now you can make your character behave just like you would do when playing a serious poker game. But of course you can turn this feature off if you just want to enjoy a 'classic' online poker table.